WEST LAFAYETTE, Ind. — The Purdue Student Health Center reported that health-care providers there treated 63 students for flulike symptoms between Oct. 5 and 3 p.m. Monday (Oct. 12). Since Aug. 30, 457 students have been seen for flu symptoms at the Purdue Student Health Center or at a local urgent care. Patients continue to have had relatively mild cases, much like the seasonal flu, and there have been no reported hospitalizations. The H1N1 influenza (swine flu) causes illness for five to seven days, so most of those who were ill should be better by now, said James Westman, director of the Purdue Student Health Center. He warns, however, that those with underlying health problems such as asthma, diabetes or a suppressed immune system should take extra precaution and inform their health-care provider. Generally, patients who are otherwise in good health have been advised to take the same steps they would for any type of flu. Individuals under age 25 are expected to be more likely to contract this strain because they have little or no immunity. Since this is not flu season, health-care providers have been advised to consider all cases of flu to likely be H1N1, Westman said. A quick test can confirm if the influenza virus is Type A, of which H1N1 is a subset. Patients are only being tested if they and their health-care provider concur that it is appropriate. Of the cases of flulike illnesses, 223 have been screened for Type A influenza. Thirty were positive for Type A, and 60 samples were sent to the state to determine if they were H1N1. Thirty-four samples tested positive for H1N1, 16 were negative and the remaining results are pending. Before coming to the health center, students are asked to call the center at 765-494-1700 between 8 a.m. and 8 p.m. weekdays and 10 a.m. to 6 p.m. on weekends. After hours, students can call for advice to the Collegiate Assistance Line at 866-272-7119, PIN 390. The Purdue Pharmacy is open 8:30 a.m. to 5:30 p.m. weekdays and 9 a.m. to noon on Saturdays when classes are in session. For those with mild symptoms, it may not be necessary to come in. At the advice of the Centers for Disease Control and Prevention, antivirals such as Tamiflu are reserved for patients with flulike illness who also have underlying health problems. If you are ill with influenza, do not attend class or go to work. If you are a student, know ahead of time what the absence policy is. Contact your professors, instructors or employers to let them know you are ill as soon as possible. If you live in a Purdue residence hall, let your residence hall advisor know. Sick meals can be prepared for you. They also can provide cleaning products for you and those around you. Stay home at least 24 hours after your temperature returns to normal without the aid of medicine. Isolate yourself. If you can, go home. If you can’t do either of these, suggest your roommate relocate until you no longer have a fever and other symptoms. 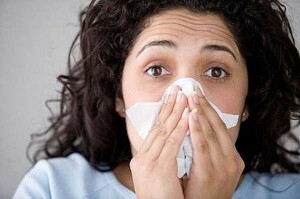 The ill person also should wear a mask when others are present to help prevent spreading the infection. Use the buddy system. Ask friends to check on you and help buy what you need. Cough into your sleeve or a tissue to prevent spreading germs. Do not cough into your hands. Dispose of tissues in a wastebasket. Wash your hands with soap under warm running water for 20 seconds and rinse your hands well. If soap and water are not available, use an alcohol-based hand sanitizer. Dry your hands using a paper towel or air dryer. If possible, use the paper towel to turn off the faucet and turn the doorknob. Be sure your hands are dry before directly touching anything. Consider getting a vaccination against the seasonal flu as soon as they become available on campus. While they will not protect against H1N1, they will protect against previously known flu strains. Flu symptoms usually appear 24-48 hours after exposure to the virus, and people remain contagious for seven days after the onset of symptoms. The first shipment of H1N1 vaccine is expected to be available on campus in October, and then more are expected to follow. Updated information from Purdue and government agencies will be available at http://www.purdue.edu/fluinfo A link also can be found on the Purdue home page.